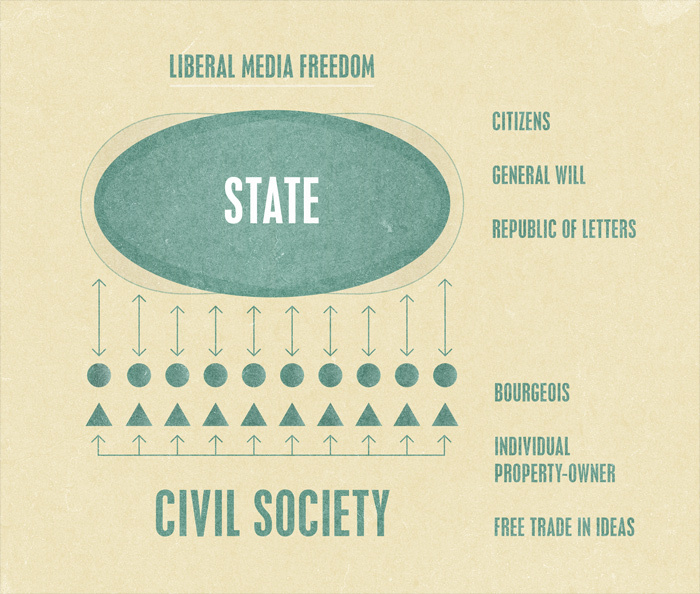 Liberalism = media freedom of individuals. Pre-modern societies = societies without media. Overwhelming majority of population lived in peasant communities. Subsistence agriculture took place outside money-commodity economy. Little travel or communications for mass of population. Both warrior elites and peasant masses were illiterate. Small priestly caste monopolise literacy and knowledge of sacred books. 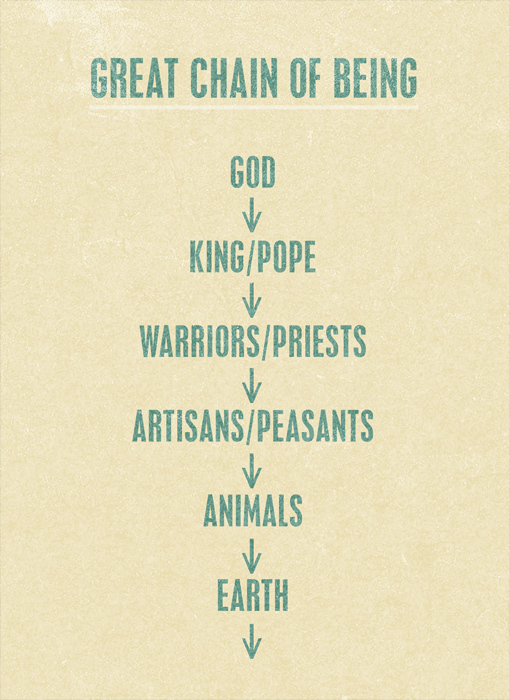 Social hierarchy of feudalism was founded upon patriarchal extended family. Walter Ullmann, Medieval Political Thought. Muhammed Ibn Khaldûn, The Mugaddimah. Advent of Modernity = invasion of countryside by money-commodity economy of towns. Money as surplus -> money as necessity. Greater travel and communications for more and more people. 1440 Johannes Gutenberg: printing press with moveable type. Book publishing as money-commodity economy: book market for knowledge about religion -> trade -> politics -> free speech in all subjects. Feudalism saw politics as private affair of kings and bishops. Early printers licensed by the monarchy and/or church. Challenge of liberalism to state controls over printing. Civil society was contract in mutual interest between individual property-owners. Civil society created by trade and commerce between bourgeois individuals operating under natural laws of the marketplace. Free press provided information for free trade in goods and services: essential knowledge about domestic and foreign markets. Fourth estate commenting on affairs of state to facilitate efficient operation of the marketplace. Free trade in goods and services -> Free Trade in Ideas as one commodity among many others. Karl Marx and Friedrich Engels, The German Ideology: part 1. Georg Hegel, The Philosophy of History. 1642 English Revolution: collapse of state censorship of printing -> propaganda war between Parliamentarians and Monarchists -> toleration of religious and political dissent. Civil liberties of Free-Born Englishmen. 1710 Statute of Queen Anne = copyright owned by publishers. Legal protection of intellectual property -> market in products of mental labour. Christopher Hill, The Intellectual Origins of the English Revolution. F.S. Siebert, Freedom of the Press in England 1476-1776. Men are both bourgeois and citizens in liberal political theory. Selfish property-owners in civil society -> altruistic citizens of republic. State as the social contract of all citizens. Direct democracy of all citizens = general will created through face-to-face discussions and mutually agreed consensus. Classical Greek agora -> village meetings and artisan trade communities of early modern Europe. Coffee houses, pubs, freemason lodges, theatres, pleasure gardens, brothels: men of all ranks meeting as equals. Small-scale democracy of Swiss and Italian city-states. Jean-Jacques Rousseau, Letter to Monsieur d’Alembert on Theatre. Representative Democracy = large nation-states with millions of inhabitants. Members of parliament were re-presenting the views of their voters. Citizens expressed their opinions by publishing in newspapers, books and pamphlets. Bourgeois ownership of printing presses = Citizenship of the Republic of Letters. Article 7 of 1793 Declaration of the Rights of Man and Citizen. Tom Paine, The Rights of the Man. John Keane, Media and Democracy. Civil and political rights was restricted to male property-owners. Active citizenship = bourgeois privilege. Passive citizenship = men without property, women and children. Slaves were property not people: John Locke -> Thomas Jefferson -> John Calhoun. Jeffersonian Democracy: freedom for white folks was slavery for black people. Liberal model of media freedom = free speech for white male property-owners. Karl Marx, ‘Debates on the Freedom of the Press’ in Collected Works, Volume 1. Domenico Losurdo, Liberalism: a counter-history.